We return to the study of traditional push-hands curriculum. 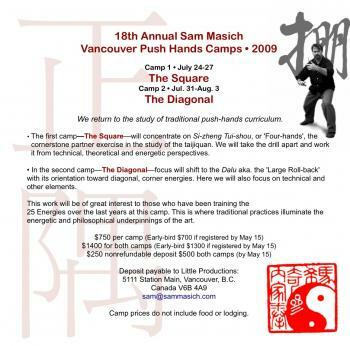 The first camp�The Square�will concentrate on Si-zheng Tui-shou, or 'Four-hands', the cornerstone partner exercise in the study of the taijiquan. We will take the drill apart and work it from technical, theoretical and energetic perspectives. � In the second camp�The Diagonal�focus will shift to the Dalu aka. the 'Large Roll-back' with its orientation toward diagonal, corner energies. Here we will also focus on technical and other elements. 25 Energies over the last years at this camp. This is where traditional practices illuminate the energetic and philosophical underpinnings of the art. 5111 Station Main, Vancouver, B.C. Camp prices do not include food or lodging.